"There's something on Marzolf Hill!" In late 2019, the 9th feature film from Small Town Monsters arrives. Help get the film made and get your name in the credits when MOMO comes to the 2019 STM Kickstarter campaign on February 7th. Visit our Facebook page or smalltownmonsters.com for more information! 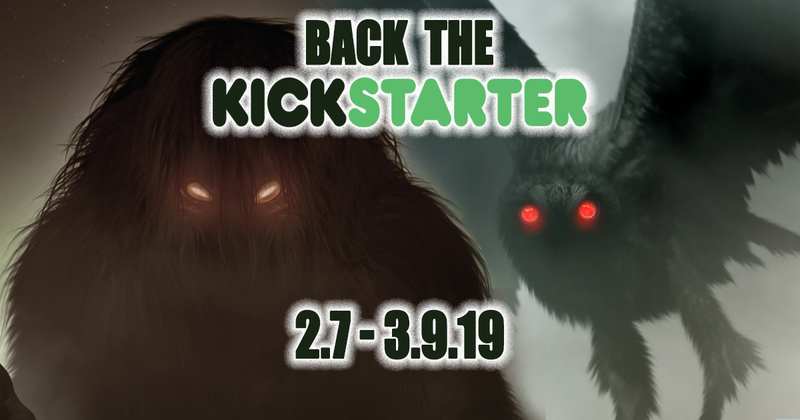 The time for our annual Kickstarter is quickly approaching and this year we'll be raising funds for Terror in the Skies and MOMO: The Missouri Monster. We’ve been getting a lot of questions about the involvement of On the Trail of Bigfoot in this year’s Kickstarter. It WILL be a part of the Kickstarter as a reward and more than likely a poster or two will be included as a reward. However, the project has already been funded so we won’t be including it in the title of the Kickstarter description since that would be a little disingenuous. BUT you’ll have to back in the first 7 days to get your name in the credits (be sure to attend our Facebook Event Page so you get reminders!) Check out the trailer below! We'll be announcing rewards included in this Kickstarter (aside from the DVDs, of course) over the few weeks. We're excited to announce that the official STM Crew Member Hat is FINALLY a part of the swag you can get when you become a backer. Don’t forget, the campaign launches on Kickstarter on February 7th! We'll be kicking it off with a launch party live from our new production office. Be sure to tune into Facebook or Instagram so you can join us as we talk about the upcoming productions, rewards, and other behind the scenes fun. Not sure how Kickstarter works? The most important thing to keep in mind is that our Kickstarters are NOT a donation. The funds that we raise get funneled back into our productions and the rewards backers receive. We work very hard to make sure that backers receive the most bang for their buck and that we're coming up with cool new ideas for rewards each year. Remember, we can’t make movies without you! Here’s the official one-sheet for MOMO: The Missouri Monster, created by Sam Shearon! Become a Kickstarter backer on February 7th and help fund our most ambitious film yet! For decades the small town of Louisiana, Missouri has run from the shadow of its most terrifying secret. In 1972, something stalked the forested area of Marzolf Hill, killing dogs and leaving bizarre, three-toed tracks. As strange lights in the night sky began to accompany sightings of the creature dubbed“MOMO”, armed posses and investigators combed the woods around town. One year later a film crew set out to make a movie based on the true events. Created on a shoe-string budget, the lucky few who saw it have called it “the most terrifying Sasquatch film ever seen”. The creature-feature was forgotten and lost to time... until now. Next Halloween, the documentary filmmaking of Small Town Monsters meets the drive-in Horror stylings of 70s cinema. 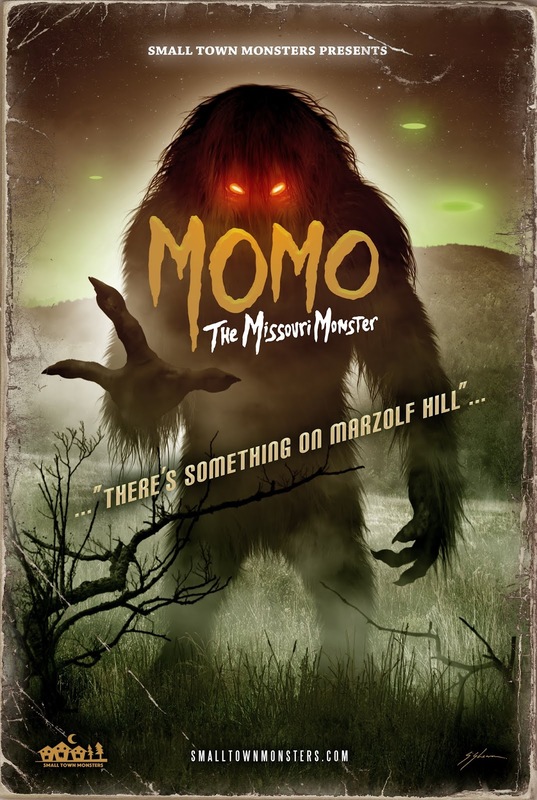 Witness the melding of horror with reality in... MOMO: The Missouri Monster. Be sure to check back here and on our Facebook Event Page for all the details about our rewards and our annual launch party!